The Merwe Solid Surface material is composed, primarily, from aluminium hydroxide and advanced synthetic resins. Considering the elemental characteristics of the material it is ideal to manufacture baths, washbasins and vanity tops. The versatility of Merwe Bathware’s Solid Surface allows to realise any form, to embody different demands, to break new ground. Easy to clean, easily restorable in case of burns, scratches, or wear derived from daily usage, preserving its performance over time by providing surface resistance and aesthetic quality. This material is available in a matt and semi-gloss surface finish that seems to resemble natural stone. Bronze superficially oxidises to form a protective barrier coating of copper oxide. Copper alloys, including bronze, have antimicrobial surface properties, giving them an inherent ability to kill a range of harmful microbes. Often within two hours or less – and with a high degree of efficiency. Bronze finds its origin towards the end of the first millennium BCE; its legacy lives on in contemporary times. Discovered by our ancestors, advanced by our grandparents and a possible asset to future generations, bronze’s particular and beneficial properties make it the metal of the ages. At Merwe, we apply traditional patination techniques to increase the natural aesthetics process of the metal. Once a patina colour started on the metal surface, it can be left to continue weathering naturally. Alternatively, the aging process could be prolonged by following the bronze information sheet attached of maintenance instructions. Zinc alloy has exceptionally high antibacterial properties killing all coliforms within a concise time frame. Zinc’s natural properties provide years of virtually maintenance-free use. Also, zinc’s blue-grey and brown patina blends beautifully with most building materials and surroundings. A patina, or darkening, will occur over time. Zinc is nonporous, anti-microbial and antibacterial. It has a smooth surface that is easy to clean and maintain. Zinc is a living alloy. It will respond to its environment. Changes in the hue of the basin will happen naturally with use. Keep in mind that while soaps, oils and salts may make a mark on the basin, because these metals are non-porous, it is virtually stain resistant. Mark that does appear fade and blends over time becoming “living colour”. Brass is a metallic alloy that consists of copper and zinc — blended to create a fusion known as brass. 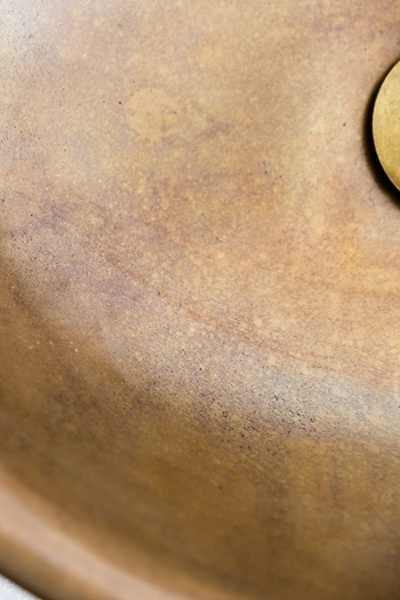 Brass is a living alloy that responds to its environment. New patination marks will appear, however, will fade and blend over time darkening over time as the “living colour” evolves. Brass superficially oxidises to form a protective barrier coating of copper oxide. Copper alloys, including brass, have antimicrobial surface properties, giving them an inherent ability to kill a range of harmful microbes often within two hours or less – and with a high degree of efficiency. Merwe applied a coating to your different patina colours prolonging the oxidisation process protecting the metal in return.